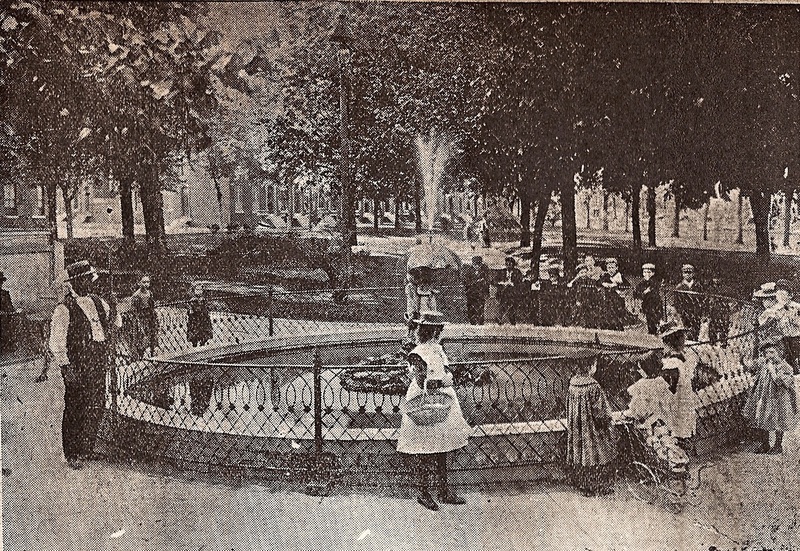 As early as the 1840s, a small oasis of green known as Perkins' Spring became a popular destination at the edge of the rapidly growing city. The park's unique value to local residents came from the fresh-water spring that poured out at a rate of 60 gallons a minute. One resident later recalled how their neighbors carried water away "by the barrel in the '80′s, especially when heavy rains flooded and polluted the normal supplies." In 1853, the city purchased a small triangle of land around the spring from the estate of Dr. Joseph Perkins bounded by Ogston Street, George Street, and Myrtle Avenue. The city hoped to protect the spring from development and preserve it as an amenity for a soaring population on the west side of Baltimore. 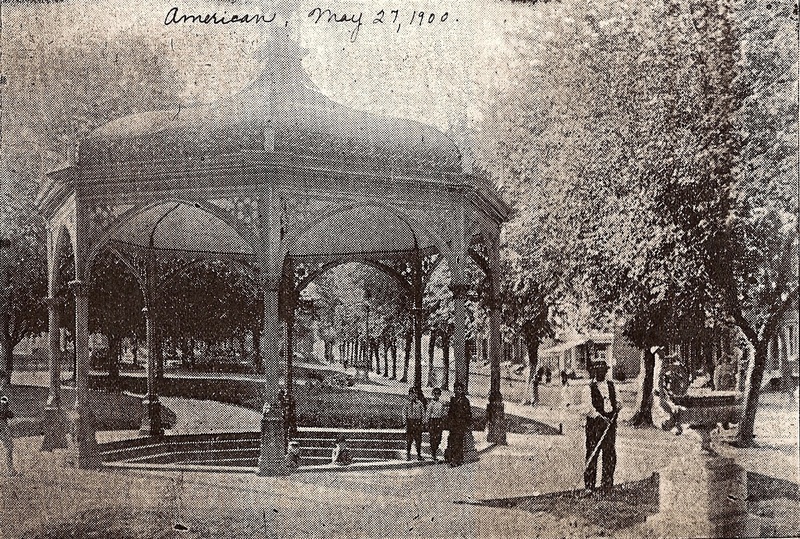 City officials soon improved the new park with a brick enclosure and a cast iron Moorish-style canopy over the spring. Mayor Joshua Van Sant appointed an official park keeper who lived in a frame house by the park's Myrtle Avenue entrance. The grounds were soon planted with hundreds of flowers of every shape, size and color, coleus and petunias the most common, all grown in the park's greenhouse built in 1887 and arranged in decorative patterns and designs. 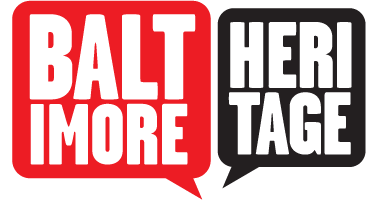 Like many West Baltimore neighborhoods, the area around the park was primarily occupied by white households at its beginning but by the late nineteenth century, the city's black community had started to settle in the area. For example, in 1880, a church built by a German evangelical congregation facing the park at the corner of George and Ogston Streets became home to an African American congregation that soon established the Perkins Square Baptist Church. By the 1920s, Baltimore's black residents used the park for every day relaxation and special entertainment. On one warm June evening in 1922, over 3,000 black Baltimoreans crowded into the park to hear the Colored City Band, established by A. Jack Thomas, performing a selection of popular marches and operas. In the decades after WWII, city leaders decried poor housing conditions in the neighborhoods around the park and resolved to address the situation through the construction of the new high-rise George B. Murphy Homes. Beginning with a ground-breaking ceremony at the corner of Myrtle and George Streets in December 1961, 758 housing units including four 14-story towers on a 13-acre site were built, surrounding Perkins Square on all sides. The complex opened to great acclaim on New Year's Eve 1963 but by the early 1970s, the housing project had already started to experience challenges. By the 1990s, Murphy Homes became known for crime and violence and plans moved forward for its demolition. Finally in 1999 on a bright July morning, 375 pounds of dynamite brought the towers to the ground. The park and the historic gazebo remain at the center of Heritage Crossing, a $53 million mixed-income development, still offering a restful bit of green for West Baltimore. Eli Pousson, “Perkins Square,” Explore Baltimore Heritage, accessed April 23, 2019, https://explore.baltimoreheritage.org/items/show/13.